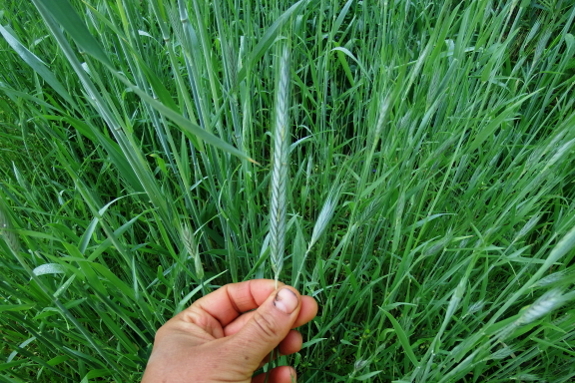 I went out with Mark to decide whether each rye bed was ready to be cut or not, and in the process I was struck by the difference in biomass production of various beds. My bed-by-bed approach to the garden means that some beds are extremely rich from lots of manure and cover crops, while other beds have managed to miss the boat on organic matter accumulation. 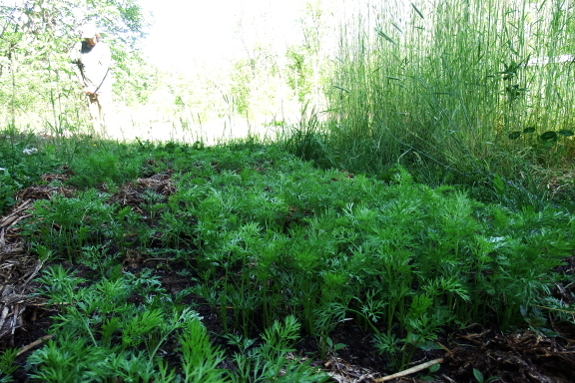 The latter beds produced rye plants less than half as tall as the former beds with flower heads that are more like a quarter of the size. 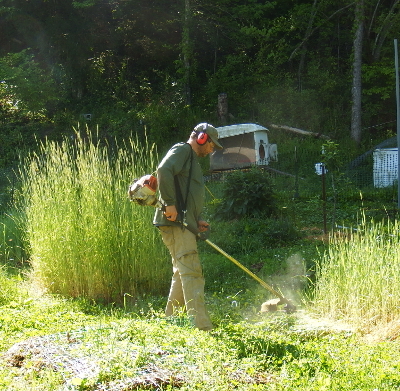 Those puny beds will get to keep their rye mulch, while I'll harvest the tops from the taller beds to use as mulch in other parts of the garden. Kayla reminded me that it was also time to take the first set of measurements from our broadfork experiment. The first bed I looked at was the mangels in the photo below. The top half of the bed was broadforked while the bottom half wasn't. Then I checked out the other beds I'd included in my first experiment. 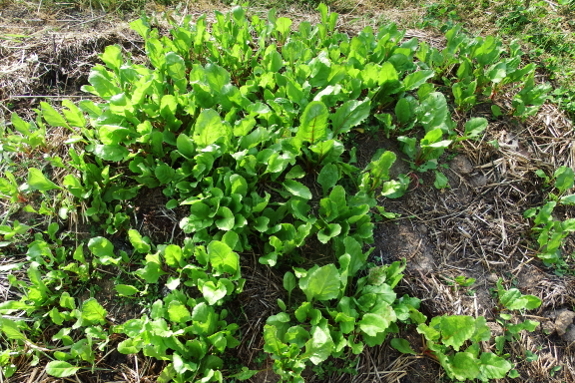 Of those, one other bed had germinated better on the broadforked side, two beds had germinated better on the non-broadforked side, and two beds looked the same on both sides. I guess there's not yet any clear result of broadforking on our root crops...but Kayla and I went ahead and broadforked half of a few more beds anyway to test out the results on summer crops. Another pressing question I'd been meaning to follow up on was --- does a low of 27 nip our fruit-tree flowers? Unfortunately, the answer appears to be yes. 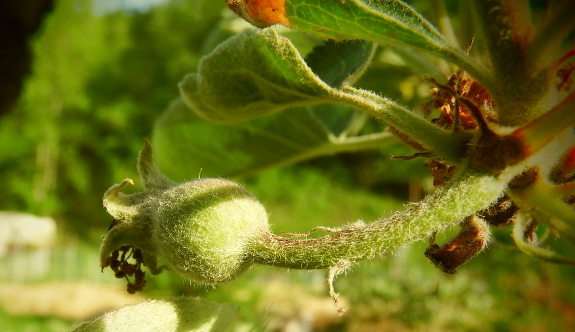 The developing apple fruit pictured above is the only one I could find on all of our trees, and the pear fruits I'd been keeping my eye on have since dropped off. 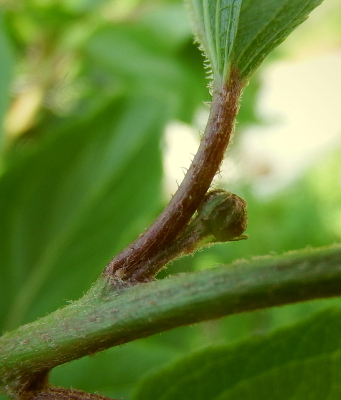 On the other hand, there's at least one flower bud on one of our hardy kiwis. So maybe we wrote them off for the year too soon? Oh no! ALL the apples and pears were lost? How terribly disappointing. we have had some recent freezes also, but I havent able to make it down to check the trees due to having to be on crutches from a knee injury. I think our blossoms have not set fruit yet, but i am sorry to hear most or all of yours were lost. It is a reminder for me that nothing is really guaranteed. But that is hopeful about the kiwi!